At one of Maine’s most popular ski resorts, Sunday River, craft beer is not just an item on the menu. It’s as much of a draw to the area as the well-groomed slopes. When you think about Maine cuisine, lobsters, red snapper hot dogs, and blueberries come to mind. But what’s best to wash it all down? Maine’s thriving craft beer industry might have a suggestion or two. Not only has Portland been named the second-best city in the country for beer drinkers the last two years by Smart Asset, but one of New England’s hottest ski resorts, Sunday River, is fast becoming as well known for its thriving craft beer scene as for its varied terrain and unique Chondola lift. The highly anticipated Sunday River Spring Festival will come in early April and is expected to draw serious craft beer fans. The weekend will kick off with The Maine Brew Fest on Friday, April 6 from 7-11 p.m. complete with live music and samplings from top breweries across the state. 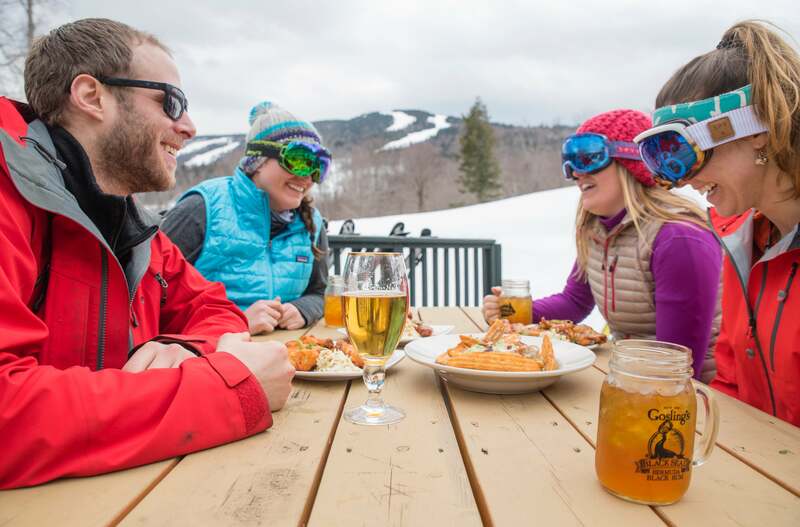 Sunday River’s pubs and restaurants pride themselves on helping skiers relax after a long day, featuring an array of the state’s offerings with new ales, lagers, and stouts regularly rotating through the taps. An important point for serious beer drinkers: Sunday River’s bars are managed independently, meaning your après ski options at the Foggy Goggle are vastly different from your choices for a draft with dinner at Sliders, a brewpub in the Jordan Hotel. “One of our big missions at Sunday River is sharing the Maine microbrewery culture with our guests,” says Justin Norman, food and beverage manager at the Jordan.Maine beer is also a regular feature of Sunday River’s special events. Last September the resort hosted 30 Maine breweries for the Maine Brew Festival that blew away everyone involved, including Caroline Ochtera, Sunday River’s events director. 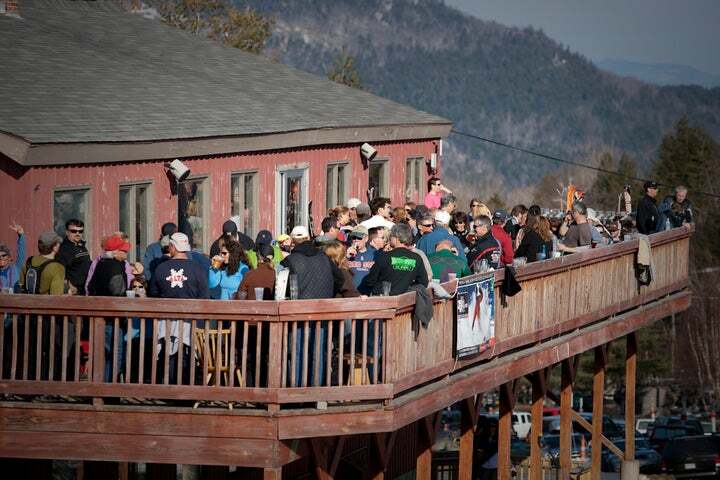 “We thought we’d sell maybe 100 tickets,” she says, “and we wound up with more than 700 people.” Westbrook-based Mast Landing Brewing Company won a fan-favorite vote, which led to Mast Landing taking over all the taps at the Foggy Goggle the last weekend of January. That weekend also saw Maine Beer Company featured in a four-course beer-pairing dinner at Peak Lodge. There are good reasons why a place like Sunday River would have such a thriving craft beer culture. First of all, Maine has a rightful claim as the home of craft beer in New England. When D.L. Geary Brewing opened in Portland in 1986, it was the first brewery to open east of the Mississippi River since Prohibition ended in 1933. Dozens of breweries have set up shop in the past decade, and not just because Maine became a foodie haven during that time. But then there is this: Skiing is not a lazy sport, it’s a sport that requires a lot of work just to get on the mountain and up the mountain, never mind then getting down. It’s the kind of hard, outdoor play that New Englanders love, that leaves you sore, sweating and tired. And at the end of a full day, from first tracks to last run, from Sunday River’s gentle Lollapalooza to the steep challenge of Wildfire, a cold craft beer is how skiers want to unwind. Maine’s craft beer scene is even having a ripple effect on the state’s economy. Come to the mountain this weekend, and you will likely find 10 Maine beers that weren’t there last weekend. Of the eight taps at Sliders, six are always pouring Maine brews, and four of those six rotate constantly. Justin Norman, the Sliders manager, says he likes to feature relatively unknown Maine breweries as well as hard-to-find offerings of the state’s better-known brewers, such as Bissell Brothers and Oxbow. He encourages bartenders to educate guests on what they’re drinking and says his crew steers open-minded customers away from national brands to local ones. Perry’s enthusiasm for craft beer is contagious and helps explain why Sunday River is embracing an identity that’s as much about its slopes as its suds. 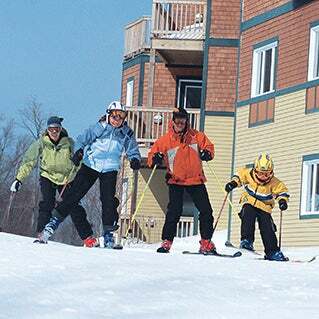 From lodging and lifts to trails and ales, here are some insider tips for making the most of your time at the Maine mountain. For you and your kids, learning to ski better won’t just happen with more runs. You need help, and Sunday River’s seasonal programs offer winter-long fun and learning for kids—and wine and cheese for adults.